Welcome Back to She is Kelechi...the new and improved version of whatever the heck I was doing before. Sure, the site looks the same, for now. And the domain hasn't changed. But my mindset has. I've had a light-bulb moment in Nigeria and I decided to take SiK* in the direction it was meant to go from the beginning. 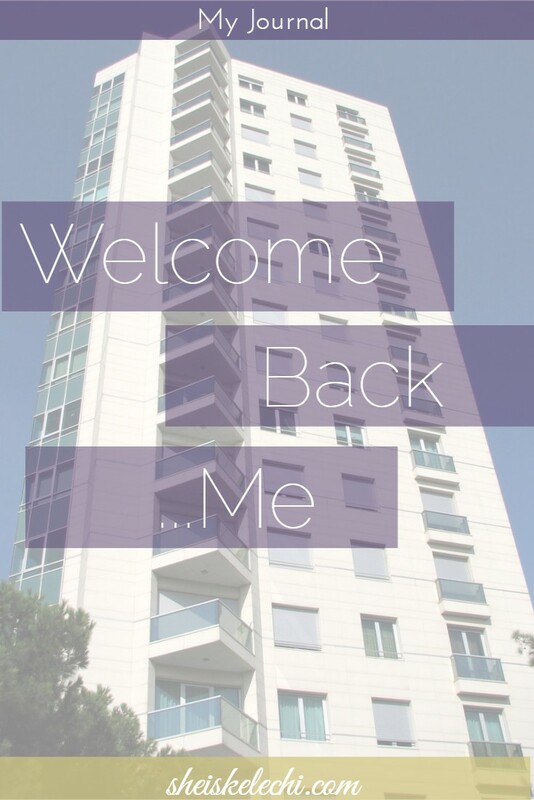 When I say welcome back, I'm really talking to myself. Because I was the one who was gone for so long. Trying to do this and that to match everyone else, finally realizing that what everyone else is doing is not meant for me. I guess I really did find myself in Nigeria. But Nigeria was awesome, and hot. I really cannot say that enough. It was Hot. And I didn't take as many pictures as I did last time, but I'm getting together the pictures I did take and will combine them with the other ones for you guys. I mean, I didn't really do anything that different, but I did meet all the expectations I set for myself. I read, a lot. (will add those to the rotation as well). And I wrote. I also had time to think about what it is I can really offer and what it is I want to do in my online world. The thing about Rise, my mantra for the year 2016, is that you can't just think it, or say it, or simply attempt to make it happen. There has to be a certain level of commitment. I wasn't totally aware of just how much commitment that was going to take. But the first quarter of the year is gone and I'm not exactly in the happiest place on earth or online. So I had time to think to myself..."what if I try doing things a different way?" Just for fun, let's see what happens when I take a step further and commit to the words I say, or write, in this case. So I decided to pivot. And what better time to pivot my mindset than after my birthday?! Yes, my birthday was on April 12th and I'm using that as a starting point to really move forward with everything I wrote down for 2016. If you're not familiar with @MyleikTeele, #1 get your life together #2 check her out. She created a journal (MyTaughtYou) that has a section in it explaining the importance of taking a life assessment. Pretty much asks you so analyze where you are now and how far are you from where you want to be. It's a painful exercise, but so necessary. I mean, who wants to acknowledge out loud, or on paper, that there are areas in your life where you dropped the ball? At least I don't, even though I feel it every day. But it's one thing to acknowledge it, it's another thing to to actually work on it. So I took an assessment of my life, I picked the three areas that I don't like the most and made it my goal to turn it around in 60 days. Not in one year, 60 days. I started this on April 5th. So now I'm like 9 days in. There are no cheat days. I've been using all my "cheat days" for so long that I've only been playin myself. In 60 days, I want to be in another city, working another job, committing to SIK and to writing. I'm going to stop beating myself up for not being perfect and stop expecting other people to show me the way, when I'm capable of paving a way for myself. With that, there are still goals I want to accomplish in the next year. And goals I want to accomplish in my life. So in honor of my 28th birthday, I created a list of 28 goals that I want to accomplish before I turn 30. I'm impatient and I don't want to wait an entire lifetime to live the life I always wanted. I'm feeling really good about this!